I remember two years ago sitting in the crowd at the brand new Matthew Knight Arena, but my jaw was almost to the floor. I wasn’t watching Johnathan Loyd slicing through defenders or E.J. Singler dropping three’s. Instead, I was watching a group of athletic, strong and ferocious women throwing their bodies everywhere and defying the laws of gravity. 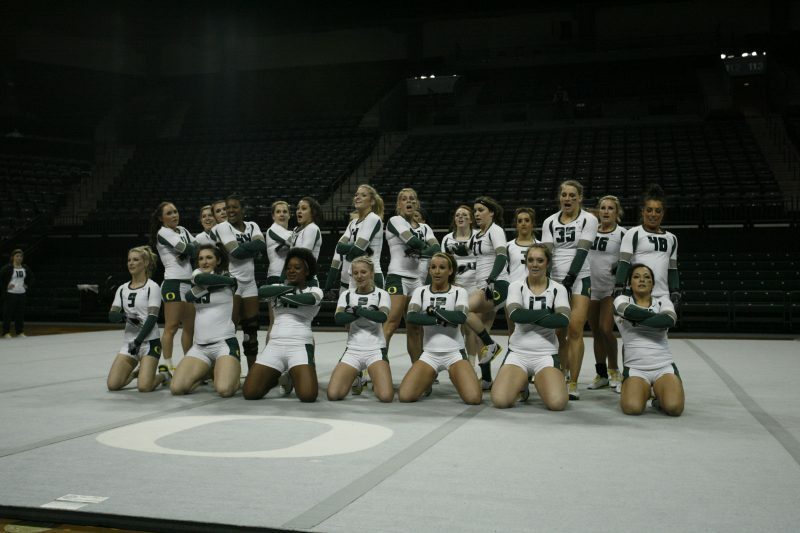 This is the UO Acrobatics and Tumbling team, and boy are they good. It is all the talent and skills of gymnastics combined with cheer and at an Oregon Ducks football pace. And guess who was the first school to start such a fast-paced, high intensity sport? Oregon. It just makes sense. I had the opportunity to sit down with Acrobatics and Tumbling Coach Chelsea Shaw at the Casanova Center to talk about the season and just how important this sport is for the development of young women. The Ducks are currently ranked #1 in the nation, and they have been for a while. Oregon has won every single national championship since the sport’s first national championship tournament in 2011. Currently, there are only 13 total teams across the nation with acrobatics and tumbling teams. There are six different events in any meet: compulsory, acro, pyramid, toss, tumbling, and team event. “It is an evolution of gymnastics so it is all the same discipline, all the same technique, all the same training and progressions… except for it’s all on the floor,” says Shaw. You’ll find no bars, no beams and no leotards. It is just you and the floor. The scoring system is again very similar to gymnastics where judges watch for pointed toes, sticking the landing and the degree of difficulty. The coaches submit to the judges beforehand the stunts the teams will perform, and then judging is based upon whether the teams did in fact do as they said and how they executed. Flying through the air in team floor work. Not only is the sport entertaining for the fans, but also these 45 women learn more valuable and developmental skills than just how to flip. More UO stunt work with fliers and bases. Being the #1 ranked team means the eyes of the nation are always on you; you have a target on your back that every other team can see; and your goal is not chasing after someone else but yourself. My Ultimate Frisbee coach always says, “It’s hard to climb the mountain when you’re already on top.” Coach Shaw is confident in the program and that the team doesn’t really let a number define them. The Ducks will be seeking another national title this April at the college national championship meet.